When a neutron star spins, it sometimes spins incredibly fast—up to hundreds of times a second. A magnetic field billions of times stronger than Earth’s can form as a result. If the field interacts with nearby electrically charged matter, it can result in a great deal of energy being radiated into space, a process called synchrotron radiation. In this scenario, the slightest unevenness or surface feature on the neutron star can cause a significant “blip” or “pulse” in the radiation being emitted. Each time the neutron star spins around once, a pulse of radiation comes out. Such an object is called a pulsar. 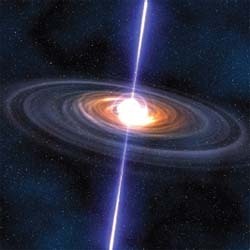 A pulsar (an artist’s concept is shown here) is a neutron star that spins incredibly fast, creating a powerful magnetic field.